#ad: This is a compensated campaign in collaboration with Latina Bloggers Connect and SlimFast. See below for Full Disclosure Policy. Un-boxing summer fun! What until you see what this simple box can do! Keeping it cool doesn't mean you have to avoid a fun and social time with friends, in fact you may even be the hit of the summer fiesta (party) with these stay cool/stay slim recipes! 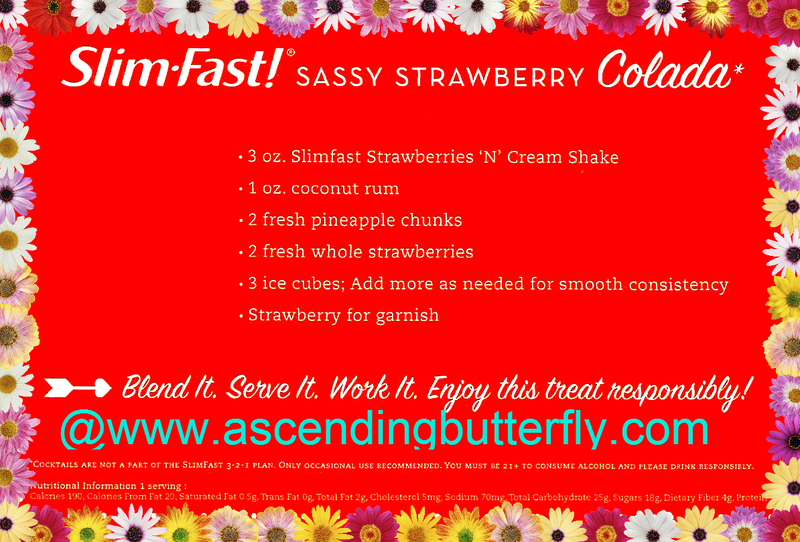 I will post all these recipes on a Pinterest Board on our Pinterest Page, it will be called #SlimFastVeranoSexy, and you will be able to see all these recipe cards full sized for easy printing! (Sorry my blog template shrinks them so much!). You can press on them to see them full sized also, then just hit the back arrow to come back here and see the rest! 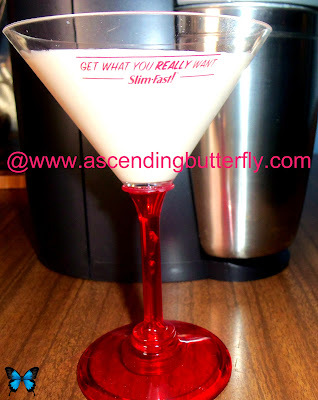 If alcohol/spirits are not for you, then try the refreshing mocktail version. 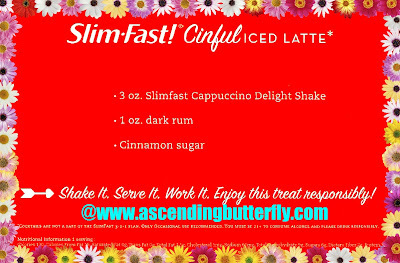 You know that with Slim-Fast Shakes you are getting not only great taste, but 10 grams of protein, 5 grams of fiber and 4 hours of hunger control, making it easy to stick to your plan and achieve your weight loss goals. But obvs with or without alcohol, everything in moderation, OK Butterfly? As you can probably tell by now, the 'daisy' border is for the recipes using alcohol, and the 'roses' border is for the same recipe without alcohol! I'm a Piña Colada lover so this one definitely went over well with me and my friends! 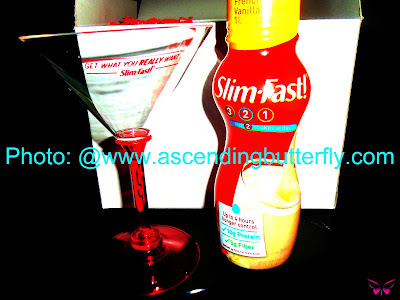 Butterfly I don't know about you, but I love to mix things up, I like to host weekly Wii parties, nothing formal, just friends and family, we love to play dance games, and these cocktails and mocktails both dovetail perfectly with our fitness games and dance fun! I made a Slim-Fast Mudslide! All the great taste, less calories, and vitamins and minerals too, what's NOT to love? These recipes are definitely helping me to mix things up, and they have gone over well at the weekly Wii party (now I will admit after working up a sweat we sometimes end things with ordering pizzas, but at least we start off right!). 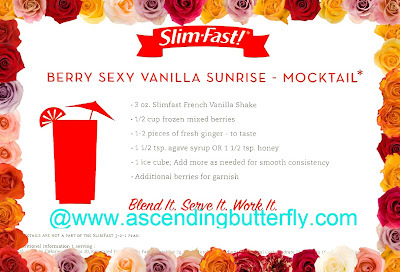 Which Slim-Fast Cocktail or Mocktail is YOUR favorite Butterfly? Note: Please remember that cocktails are NOT a part of the SlimFast 3-2-1 plan. Only occasional use recommended. You must be 21+ to consume alcohol and PLEASE drink responsibly. Losing more than 2lbs per week is NOT recommended. Exercise 30 minutes daily and follow the SlimFast plan. 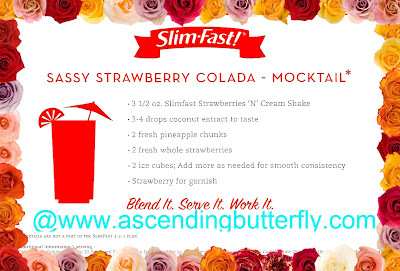 FTC Disclosure: This is a compensated campaign in collaboration with Latina Bloggers Connect and SlimFast. See our Giveaway and Disclosure Policy Page for more information.